Blake returned to school and graduated with his BBA from the the University of Michigan Ross School of Business. Diploma in hand, he pursued his dream and started his career at Deloitte Consulting. 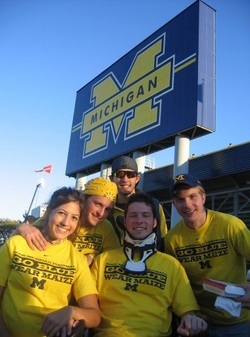 In his move to a local role, Blake worked at Google in Ann Arbor before following his long-term plans of returning to graduate school at the University of Michigan as part of the incoming class of 2013. With firsthand knowledge of the challenges faced by individuals with SCI, and an understanding that his career opportunities were a direct result of his education, Blake founded the Spinal Cord Injury Foundation to support others with SCI in pursuing a career. Blake knows that other individuals with a SCI have the ability to be successful in life, but with their new life challenges an education is of increasing importance. As you reflect on how your education has impacted your life, we ask that you consider helping individuals with an SCI through a donation to the Spinal Cord Injury Foundation.